The student group is formed of undergraduate students studying at the University of Chichester who aim to fundraise for, and increase the profile of, the AWF within the University and surrounding local community. The group is led by two co-chairs wishing to reflect their passion for women and sport to other students at the University. Lilley Kennedy is a second-year Sport Business and Management student. She has participated in swimming, dance and most recently football as well as coached multisport to children aged 4-11 for three years. Nicole Soriano is a second-year Sport Development and Coaching student. She is a keen netballer and sport has played an important part of her life. 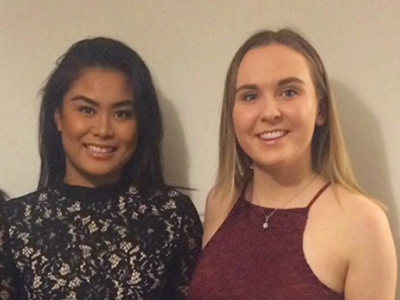 Lilley and Nicole became interested in the AWF in their first year as it resonated with their passion for greater equality in sport and the progression of the women and sport movement. The group offers fantastic opportunities to make a change for women’s sport. Moreover, you can gain accreditation and transferable skills to enhance your CV. Since 2012, there have been many opportunities for students meet international athletes and scholars and assist with fundraising. The group was first led by Sam Leo (2012-2014) who attended the AWF’s launch and was inspired to advance women and sport issues. Sam led the group brilliantly and began to establish the group within the student cohort at the University. 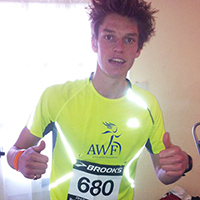 Members such as Colette Gooding and James Faudemer (who completed the London Marathon – pictured) assisted at AWF Events and raised over £1500 for projects too. Between 2014-15, Sam Southon was Chair of the group and introduced a new structure of roles and responsibilities. 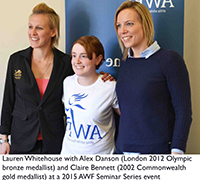 Sam's work, determination, and continued interest in women in sport were acknowledged at Graduation 2015 with the AWF Award for the student who has made the greatest contribution to the development of women and sport during their studies at the University of Chichester. Lauren Whitehouse was chair between 2015-16 and contributed to local events as well as construct an action plan for the group. Lauren was awarded the academic prize for Sport Development and Management at the 2017 University of Chichester Students Union Women of the Year Awards.